I know that I am not the only one who has old things sitting in my house that should really go out into the trash, but that I hold onto for some reason. I also know that I am not the only one who goes to thrift stores or antique shops and purchases items that, well, really don’t have a place in my home, but that I am for some reason drawn to. Well, with a little creativity and some time, the truth is, you can make something old new and exciting. With these craft ideas, you can truly turn what others might regard as trash into treasure. For some clever craft ideas that will allow you to make something old new and exciting, keep on reading. Old Shutters. Do you have old shutters that once hung on your house but have since been removed because the paint is chipping from them, because they are weathered or because they are broken? Don’t throw them out just yet – you can actually use those old shutters to create some really neat craft projects. Repair any broken slats on the shutters, sand them and add a few coats of fresh paint. You can then use the shutters to create a variety of things. One idea is to hang them above your head, creating a rustic, country chic headboard. Another option is to secure a few shutters together and stand them up, creating a partition in a room. You can also just hang one or a few shutters on a wall and use them as an eye catching display board; use tape or tacs to display photos or postcards on the shutters. Use your creativity and you can easily make something old new and exciting. A Watering Can. Just like everything, water cans warp, get holes and just wear out over time. Before you through that old watering can out, however, use your imagination to make something old new and exciting. You can drill a few holes in the bottom of the can, fill it with potting soil and plant a few colorful annuals inside, creating a one of a kind planter. You can also purchase a lamp hardware kit from a hardware store, follow the instructions provided in the kit and turn the watering can into a unique lamp. An Old Picture Frame. Almost everyone has a picture frame with broken glass inside. While you may think that there is no life left for that frame, the truth is, you can make it into something new and exciting with a little time. First, get rid of that broken glass. Next, give the frame a new look with some paint or use some sandpaper to remove some of the finish, giving it a shabby chic look. Once the frame looks how you want it to, you can turn it into one of two things; one being a mirror and the second being a message board. To make it a mirror, purchase a plane sheet of mirror that fits the interior of the frame. Apply adhesive around the edges of the mirror and position it in place inside the frame. To make a message board, cut a piece of cork board to fit the inside of the frame. Attach the cork board to the interior of the frame with adhesive and you have an instant message board. 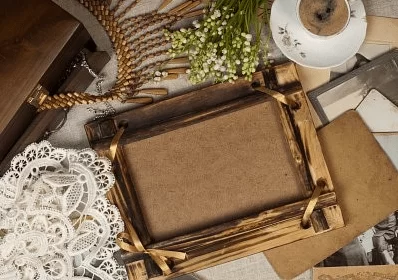 Not only do these craft ideas turn something old into something new and exciting, adding a unique and striking decorative element to your home, but they also do good for the environment, as they help to save some room in landfills. With a little creativity, you can really turn trash into a treasure. READ Why do you want to sew your own clothes?